Technically, I could leave this page blank. The title of this post is a little rhyme in itself! While yesterday's poem may have set literature back several decades, I thought I'd do something a bit more serious today. In the DC area, it's Cherry Blossom Festival time. Tourists are everywhere. We're also having a Nuclear Summit. If two events could ever go together better than these, I don't know what they'd be. 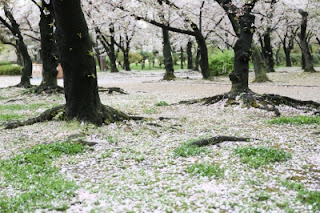 Anyway, cherry blossoms (or just blossoms) are key words used in traditional haiku to designate the season of spring. Considering the local festival that's going on right now, a haiku (or two) along that line seemed appropriate. Also, I envy you your early cherry blossoms, surely one of the prettiest sights on earth.